You’ve seen it on the news and read about it in the press, now you can book Thomson Dreamliner flights on the new Boeing 787! Thomson Airways took delivery of their stunning new 787 Dreamliner in May 2013 and started flying to Florida and Mexico straight away with other destinations in the pipeline. You can book your flights to Florida and Mexico through Thomson’s holiday outlets, First Choice and Thomson Holidays. Why not be one of the first to try out Thomson’s Boeing 787 Dreamliner and find out how this plane is set to change the future of long-haul flying forever. 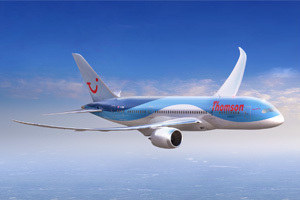 Thomson’s are the first UK airline to introduce the Dreamliner and will carry 291 passengers in a 2 class configuration. 47 premium club (2-3-2) and 244 in economy (3-3-3). They have ordered a total of 13 Dreamliner’s and will roll them out over the next few years. Thomson Dreamliner – Which destinations do they fly to? Thomson Airways will start flying direct to Mexico and Florida in 2013. Destination Update 31st Oct 2012 – Thomson have now announced they will fly their 787 Dreamliner direct to Phuket in Thailand. They will start taking bookings from 15th November 2012 and commence service in November 2013. Customers can enjoy 2 of Thomson’s re-branded properties, a Splashworld in Phuket and a Thomson Couples resort in Khao Lak. Thomson will debut the Dreamliner at Manchester, London Gatwick, Glasgow and Easy Midlands initially. How big are the 787 Dreamliner seats? Careful planning has gone into the seats aswell as the pitch. Thomson Dreamliner will boast a massive 33″-34″ seat pitch in economy, that’s more legroom than British Airways, Virgin, Thomas Cook and Monarch airlines. If you decide to upgrade to Premium Club, you’ll get to take advantage of 38″ seat pitch, leg rests and further reclining seats. This puts Thomson Airways in the same league as Virgin and BA for Premium Economy. This aircraft truly is a ‘Dream’ liner and we’ve put together a brief list of the little things that set it aside from the rest. Cabin Headroom – Over 6 foot at its lowest point, which makes the whole cabin seem huge. Bigger Windows – All windows are 30% bigger on the Dreamliner giving you unprecedented views when in the air. What, no blinds on the windows? – That’s right, the windows on the 787 can be dimmed at the touch of a button. Mood Lighting – Sounds exotic, but the lighting on the Thomson Dreamliner is high-tech and can mimic things like sunset or dawn and keeps your body clock in sync. Seatback Entertainment – Plug in your iPod/iPhone or tablet computer and watch movies or connect your digital camera to view your holiday snaps. The Thomson Dreamliner is made from ‘composite’, a selection of different materials meaning it is lighter, stronger and more aerodynamic. Superfast – The 787 can fly upto Mach 0.85 or 640 miles per hour. Boeing’s 777 aircraft can fly at 560mph and the Airbus A380 double decker flies at 587mph. Smooth – The Thomson Dreamliner is fitted with turbulence sensors on the rear wings meaning a smoother all round flight, even if your prone to travel sickness. More oxygen is pumped into the cabin during your flight so you’ll leave the plane feeling fresher. Quieter – They say the 787 is upto 60% quieter than conventional aircraft on take-off and landing, and substantially quieter at cruising altitude. Due to brand new engines and the materials used to build the 787, it produces around 20% less carbon than other aircraft on a standard flight from London to the USA. The Thomson Dreamliner can also fly upto 8,000 miles without the need for refueling, enabling you to spend less time travelling without the need for changing aircraft. When can I Book Boeing 787 Dreamliner flights with Thomson and First Choice? If your excited by what you’ve read above, and can’t wait to try out this fantastic new aircraft, then book your Boeing 787 Thomson Dreamliner flight today! ← Are budget airlines really low cost?